Alyssa Silva and her family with Robert Kraft and Matthew Slater. 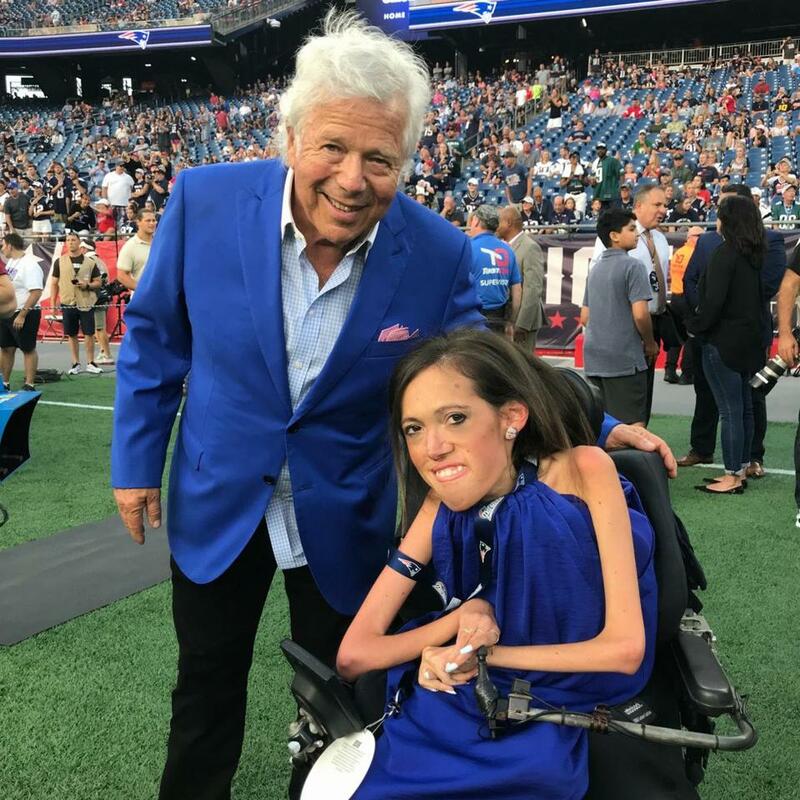 Those who watched ESPN on Super Bowl Sunday this year may recall seeing an “E:60” segment on Alyssa Silva, a Patriots fan who was diagnosed with spinal muscular atrophy (SMA) when she was six months old. Silva has built a special relationship with the team over the years, attending preseason games as a guest of owner Robert Kraft. Before this past Thursday’s contest against the Philadelphia Eagles, Silva and her family headed to Gillette Stadium with ESPN along for the ride for what Silva thought was simply a follow-up story. 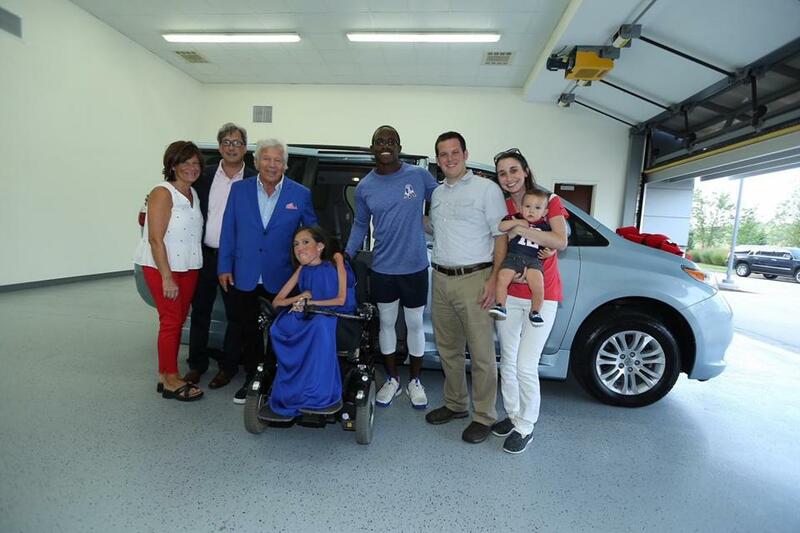 While the network was indeed there to film a follow-up, they also wanted to be present to capture Silva’s reaction when Kraft and Patriots special teamer Matthew Slater (Silva’s favorite player) surprised her and her family with a brand-new handicapped-accessible van. There are no words for this moment. No words to describe the feeling when Robert Kraft hands you the keys to a brand new handicapped accessible van he purchased for you. No words to describe the amount of gratitude in your heart for this man?s kindness, generosity, and friendship over the last several years. No words to describe how truly undeserving it felt to accept such a grand gesture. No words. . For about a year now, my family has been searching for a used van. The one we had worked, but it was on its way out. And, with the amount of traveling I do, it wasn?t safe enough for my needs. We feared that one day it would die, leaving me carless and homebound, but there was one problem. A used and older model van costs about $40,000, and that?s money we just don?t have. . As a daughter, it hurts to see my parents go through this. It hurts knowing that, because of my SMA, there are extra financial burdens placed upon them. . But, thanks to RKK and the @patriots, last night they lifted one of those burdens for us. Last night, they eliminated the fear of driving to the hospital at 4am during an epic snowstorm, wondering if the van would make it. Last night, they orchestrated the biggest, most unimaginable surprise my family and I have ever received. . Watching this video makes me ugly cry the same way I did when I first realized what was happening. And, you get to watch all the ugly crying unfold on ESPN this fall because *SURPRISE ALYSSA* they were in on the whole thing, too. . Today and forever, I am humbled. I am unworthy. But, I am the most grateful. Thank you Mr. Kraft. ? Silva said the van, which came from Mobility Works in Plainville, took her and her family completely by surprise. Silva shared a video of Kraft handing her the keys on Instagram. Robert Kraft and Alyssa Silva. Silva said that her family had been searching for a used van for about a year, but that even buying a used or older-model van was cost-prohibitive. Silva said that, while she’s been a Patriots fan “since day one,” her appreciation for the team has grown after befriending two members of the franchise’s public relations team, Stacey James and Anne Noland, who have given her a closer look at the team’s actions beyond the gridiron.